ITEM #198336 and ITEM #162401 are the big ones for me; I had no idea Yamato even existed until AFTER she was released, and Calne (or at least that version) released back when I wasn't collecting figures yet. I got lucky with some figures that were regrets for a while, though. ITEM #167033 is a figure I missed out on and was pretty upset about until the re-release came out and I got that. Same for ITEM #27602, it initially released before I started collecting. ITEM #363046 is a figure I didn't pre-order thinking I'd find her easily after her release, but her price shot way up and I ended up snatching up the re-release as soon as it was announced so I wouldn't miss it and regret it again. There's also an interesting situation with one item in my collection that I ordered thinking I might regret it, but didn't: ITEM #577747. 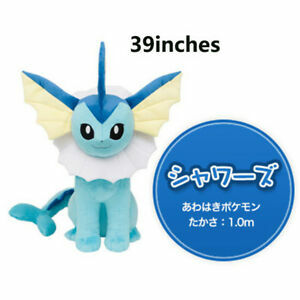 The original prototype pics were SO derpy it wasn't even funny (this is the best pic I can find of it), but I ordered one anyway because I felt like otherwise I'd always regret not getting a lifesize plush of my favourite Eeveelution. Needless to say I was relieved when the prototype was updated! The final product turned out gorgeous and even my best friend who gives no fucks about Pokémon thinks it looks cool. No problem! Glad to help you guys out, considering how long and difficult the search can be. tundras (3 månader sedan) #48316256I found it here, albeit bundled with other stuff. The description says it's unable to be split up, so I hope you find it at a more reasonable price in the future. I found it here, albeit bundled with other stuff. The description says it's unable to be split up, so I hope you find it at a more reasonable price in the future. Sundae (3 månader sedan) #48214995I also could have bought ITEM #260611 from someone on tumblr for $28 and now I honestly can't even find it on most sites; when it does pop up it's surprisingly expensive. Although if proxying is a bit daunting for you, it looks like this eBay seller has it for a similar price to what you originally found it at. I think my only 2 "regrets" were Yamato's Heavy Armament ITEM #198336 and Illya's Beast Ver ITEM #287678. Yamato came out around the time I first started collecting so I didn't know anything about aftermarkets and price gouging and all that crap. Illya I didn't preorder because I thought she'd be available for a while then when I went to order her she was sold out everywhere, and now costs a ridiculous amount of money (luckily they released other versions from other companies, but I want to complete the set). Oh, and although not a figure per se, but the Black Box version of Nier:Automata was something I'm super sad I didn't get. Luckily they made a better stand alone figure of 2B to make up for it. I actually have more situations of the opposite, where I preordered something for the hell of it or because someone told me to and I ended up avoiding massive regret. huke's Salter, Index's 1/4th bunny, Trudy's Jet Striker to name a few. Too many to count. But the main regret was the Fate Grand Order Saber Deluxe from Aniplex+. Still regret to this day.